On a trip down to Tacoma this weekend, I hit up Engine House #9 for the first time. Located pretty much across the street from the Red Hot, there were some solid beers, some not so great beers, and a couple really good beers (Fresh Hop Harvest and Bourbon Barrel Stout). 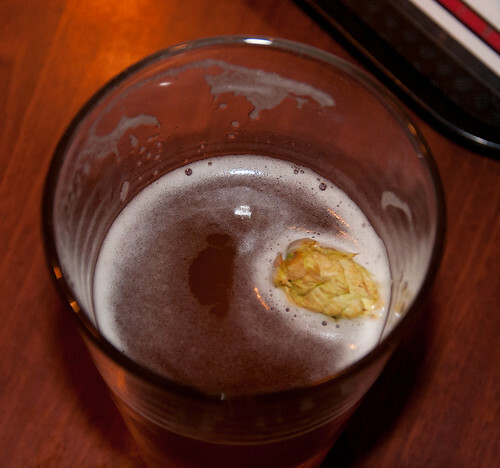 Pictured here is their Spike’s Harvest Ale, which was made with fresh hops from a customer’s back yard, and served with a fresh hop in the glass. Very nicely done fresh hop pale with lots of green hop flavor. We nabbed the last half pint from the keg on tap this weekend, and the bartender couldn’t find another keg in back, so no idea if there is any left. Use to love that bar in the mid 80’s. They still had the horse stables as the booths, fire catches covering the ceiling and 20 + taps when most bars had 2. They served the Pyramid beers (from Ballard) in Cast also. A friend and I finished the beer club and had our names put on a plaque. Most expensive T-shirt I ever bought at a bar. Loved it. Hope it is still a great place.